Shangrila Home vzw is a home for streetchildren in Kathmandu Nepal. It is founded in 1995 and developed by 2 Belgians : Inge Bracke and Paul Jacobs. Inge lived in Nepal and began by trying to feed the street children of Kathmandu but this was never going to be enough. These children had to sleep in deplorable conditions in the streets of Kathmandu. She started looking for a safe, sheltered place for them to live. This was the beginning of SHANGRILA HOME for street children. 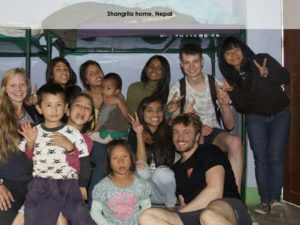 Presently, SHANGRILA HOME is a fully developed project, offering more than 80 children a warm home, food, medical care, education and a lot of love and care from the many volunteers who’ve been working there over the years. All volunteers receive only board and lodging, but it is still a very rewarding experience for all concerned. Wim De Becker, an ex-volunteer who lives in Kathmandu, took over the management of Shangrila Home in 2006. Paul Jacobs is the chairman of the organisation that does the fundraising in Belgium. Please refer in the donation my name or the following “Jelle roeit” so we can get an overview how many donations are made. I give presentations as well about my personal life and expeditions, this money goes completely to the home as well.